Is it enough to only be SMART when setting goals? We have all heard about SMART goals and how useful it can be to use the SMART process when setting goals. Goals should be specific, measurable, attainable, realistic and time-bound according to this method of setting goals. But is it enough to only be SMART when setting goals? What about evaluating and monitoring the goals or feedback about how things are progressing? If I’m only worried about, “have I accomplished the goal?”, I will miss the opportunity to monitor progress and make adjustments to the goal that I could have made before the due date. Evaluating and monitoring progress on a regular basis can help determine if you’re on track, if the goal needs to be adjusted, and can help motivate you to accomplish your goals. A lot of us have an activity and step tracking device and if you’re using it, you probably look at the device several times a day to see how many steps you have for the day. You probably think “I already have 15000 steps.” or “I need 2500 more steps today to reach my goal.” That’s evaluation and progress monitoring! The constant and readily accessible feedback these devices provide is essential to helping you accomplish your goal. If you still need 2500 steps, you revise your plan and make sure you do those steps. Many educators already use the SMART process to set goals to help improve student outcomes. Many educators also use some form of progress monitoring and evaluation to make sure the student is on track to complete his/her goal, but frequently this is done manually with pen and paper or with an older technology such as a spreadsheet. Although these tools can be helpful, a goal setting system that brings all of the data together and allows for more collaborative and accessible progress monitoring is more effective and efficient. Similar to the accessibility of the activity tracker devices, eScholar myTrack provides educators with accessibility to the data, goal setting functions, and progress monitoring capabilities that educators need to effectively monitor student goals. myTrack provides the ability to view the overall status of the goal and strategies, to log specific progress for the goal, and to make revisions if necessary. If the student is behind schedule, the goal and strategy can be adapted; if the student is performing better than expected the goal and strategies can be adjusted to make them more challenging. Educators can clearly see a status indicator of “Off Track” or “On Track” as shown in the screenshot below, helping them to identify which strategies to review and revise. 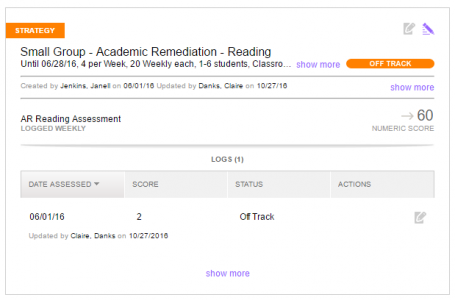 The visual and accessible progress monitoring in myTrack provides educators with the feedback necessary to make adjustments before the goal due date, enabling a more effective and efficient SMARTer goal process. At eScholar, we believe in the importance of setting smarter goals, whether it’s a strategic company goal, a team goal, or a more personal exercise goal. At the beginning of 2016, the eScholar myTrack team set ten goals to be accomplished by the end of the year. One of these goals was to write at least two technical or design blogs for the eScholar Blog. My teammate, Gino Afable, wrote one of these blogs, “Design and Student Data Management”, earlier in the year. By writing this blog on SMARTER goals, I’m excited to report that we have accomplished our team goal on blogging! If you would like to learn more about how eScholar myTrack can help you set, evaluate and revise student goals, please contact us at sales@escholar.com.